After the leading-edge Solar Homestead designed by Appalachian State University students and professors and cosponsored by Deltec Homes earned the People’s Choice Award at the 2011 U.S. Solar Decathalon, it seemed clear that the net-zero dwelling had a future. But, what came next? That win caused Leigha Dickens, Deltec’s green building coordinator, to consider the options. “I had someone call and say, ‘Hey, can I buy that?’” Dickens says. In a market where many homeowners are looking to reduce energy consumption, it seemed like a good prospect. So the ASU team tweaked the design—making the home slightly larger and adding a few more features—and now, the plans and prefabricated structure are up for sale. “It’s a great fit for anybody who’s trying to build a really green, low-carbon house,” says Dickens. The design offers modern lines with a traditional muse—the long front porch of an Appalachian homestead, which inspired the home’s expandable floor plan. Starting with a two-bedroom, one-bath, 1,032-square-foot layout, flex space can be added. Along with its solar array, the home is well-insulated and airtight, with a high-functioning heating and cooling system. 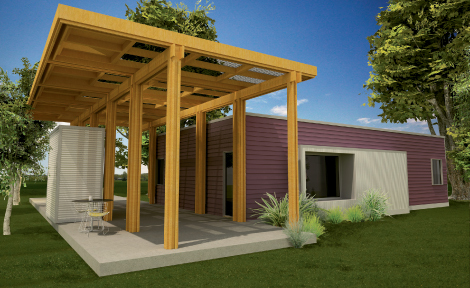 A portion of proceeds from Solar Homestead sales will go back into the ASU building science department, bringing the innovative project full circle. Image courtesy Deltec Homes, Inc.